Here are cheap deals for the Wismec CB-80 80W Box Mod. 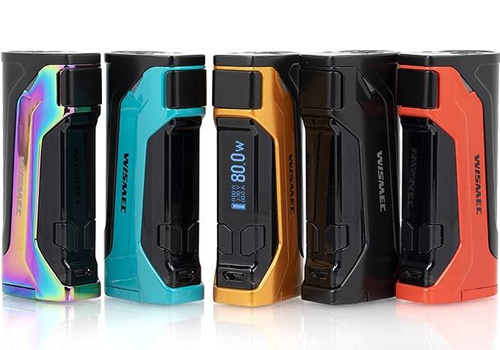 The Wismec CB-80 (or Check Bunny 80W) is the latest device from Wismec. It features extreme portability, a single 18650 compatibility, 80 watts of power, low atomizer resistance, a fast 2A charging system and lightning fast firing. Design-wise, this tiny mod only measures 80.4mm x 36.4mm, making it perfect to work with a low wattage tank when you leave the house. The mod is also available in a kit with the Wismec Amor NS Pro which is said to be perfect to use with high nicotine or nicotine salt e-juices. Compared to the previous CB-60, the CB-80 Mod also has brand new finishes that include red, black, dazzling, orange and blue. On the control face, you will see a traditional display that shows vape data in white font and a horizontal orientation. The menu includes indicators for battery charge level, resistance, voltage, amperage and wattage/temperature. Technically, the 80 watt CB-80 Box Mod is quite versatile as it has a bypass mode, a power mode and several temperature modes that work with TCR, nickel, titanium and stainless steel up to 600 degrees Fahrenheit. What sets this mod apart from the rest of the field is the fact that it fires with a lightning fast/ instantaneous 25milliseconds response time. For power, the Wismec CB80 Box Mod utilizes a single high amp 18650 battery that is inserted into the battery bay from the bottom. Accessing the bay is done via a hinged cover that is slides and flips open and recharging the battery can be done via the micro USB port at the bottom of the control face. The charging process is very fast as it utilizes a 2 amp current to top off the cells.